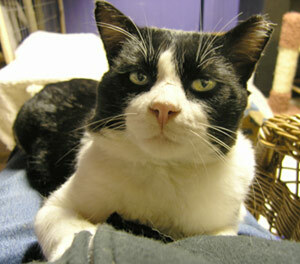 Ogden is very affectionate & will lick your hand for hours. Ogden is a very sweet & very special old fellow. 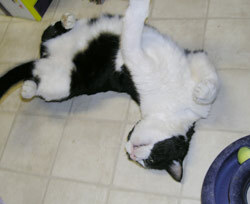 He was living on the streets of Front Royal, VA where he & an other cat were being fed by Joyce each day after work. Ogden really tugged at her heartstrings with his droopy, lonely eyes. He'd follow her meowing as she entered the building & would be waiting for her at the end of the work day. Joyce hated to leave him outside but already has many indoor cats & her outdoor feral run is also full. So she kept feeding him & the other cat each day. Then, one chilly day last November, Joyce noticed Ogden was in rough shape. He'd been in a fight, or more than one, & was scratched up bad from head to toe. She brought him to the vet where he got checked over, neutered, vaccined, combo-tested (negative : ), dewormed & antibiotics for his injuries. CR!FR offered Ogden a temporary home where he could recuperate from his ordeal. When he arrived, poor Oggie looked quite worse for the wear (Click here for Oggie's "before" pics). The fur at his wounded areas had been shorn at the vet & did he look scruffy. His head, elbows, neck & forelegs were covered in scratches, some pretty deep. There was a big bloody scratch across his nose. Beneath his patchy fur you could feel dozens of scabs & scratches all over his body. It was as if he'd been attacked by a swarm of angry rats. Several of his teeth are broken. Even the third eyelid on one of his eyes had been torn. Poor weary Ogden rested up while he healed & feasted on canned food. 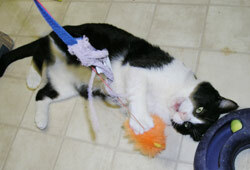 He later shared the kitten room with Machipongo & Mantenna, 2 sweet little 9 week-old kittens. 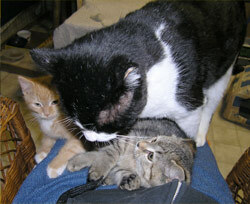 They got along great, Oggie was very gentle & fatherly with the rowdy fluffballs. Predictably, Oggie wasn't universally welcomed among the CR!FR cats. He couldn't walk 10 paces without getting hissed at. Now he's totally assimilated & is one of the gang. He's often found sleeping back-to-back or in a tight-knit clump with cats that hated his guts a while ago & now don't bat an eyelash. Perhaps his loud snoring lulls everyone to sleep. Today, Big Og is a handsome, silky, bright-eyed, wonderfully sweet fellow. He's so gentle & friendly. He loves to sit close by, purring loudly, & thoroughly lick my hand. He's also very playful in his mellow way; he chases the broom when I'm sweeping. He likes to flop down, grab my arm & thump my hand with his hind feet. He follows me everywhere, he just wants to be close by. What a love.